Daily fantasy sports are all the rage in the industry right now, and I know fantasy hockey participants are always looking for that inside edge. With a busy Saturday night of hockey action ahead I have decided to supply my fantasy hockey lineup with insights and analysis. C Jeff Carter – $6,000 The Edmonton Oilers are a terrible team defensively. They look like they may be improving, but they are still no match for a line that features Jeff Carter and Tyler Toffoli. At his price tag and with his matchup, Jeff Carter becomes an almost automatic play. 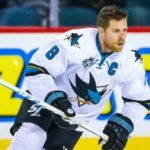 C Joe Pavelski – 7,400 Pavelski is now up to nine goals on the season — fourth most in the NHL. The 31-year-old has scored a league-high four game-winning goals thus far and is sporting an impressive plus-8 rating. Having recorded 14 points, 58 shots on goal and two power-play tallies on the year, the all-around fantasy stud should be in your lineup every night. W Brendan Gallagher – 5,800 Gallagher has five points (two goals, three assists) and eight shots in the last three games. 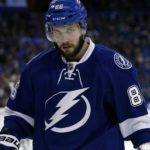 W Nikita Kucherov – 5,600 Kucherov has eight points in his last ten games, playing inspired hockey entering tonight’s battle of Florida. W Jeff Skinner – 4,500 The Flyers allow more scoring chances than any team on the slate, and it’s not even close. It’s only getting worse, so Skinner could be a good option tonight. D Cody Franson – 3,400 Cheap price-tag with massive upside. D Kevin Shattenkirk – 4,600 Shattenkirk has only appeared in six games this season due to injury. This price is extremely low for his potential. Tonight could be a breakout performance for him. G Jonathan Quick – 7,500 The Edmonton Oilers are the team I cheer for. In DFS you have to put allegiances aside and go with the safe bet. UTIL Nick Foligno – 5,200 Foligno has not had the best start to the season, scoring 7 Points in 17 games, only one of which was a goal. He is too good for this, though. Look for him to score more frequently moving forward. 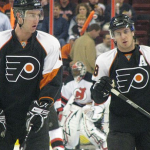 Who Are The Best Five Wing Players In The NHL Right Now?